Algeria and Transatlantic Relations is a joint product between the Transatlantic Leadership Network and the Forum des Chefs d’Entreprises (FCE) of Algeria. It engaged respected scholars to produce articles revealing Algeria’s rich history and the history of its ever-growing relationship with the United States. Authors in the publication include: Rachida Addou Boukaila, Abdelmadjid Attar, Pamela Beecroft, Mehdi Bendimerad, Omar Bessaoud, Kamel Bouchama, Abdelwaheb Boukaila, Samy Boukaila, Hamid Boukrif, Salah Brahimi, Ismael Chikhoune, Boumediene Derkaoui, Ali Haddad, Ali Haroun, Abderahmane Khelifa, Habib Merabet, Abdelkarem Messahel, Ali Oumellal, Jonathan Roberts, Mohamed Skander, Sasha Toperich, and Ellen Wasylina. The Forum des Chefs d’Entreprise (FCE) is an economic organization created in October 2000 by a group of businessmen. Its role is to represent the interest of Algerian companies and act as a partner to the Algerian government. Together, the 4000 members represent 7000 ﬁrms, with more than 400,000 jobs and close to 40 billion USD in revenue. With major Algerian companies among its members, the organization creates new business opportunities for both local and international partners. The FCE’s main goal is to boost and support entrepreneurship and to promote a fruitful dialogue with the government and other actors, such as trade unions and media. 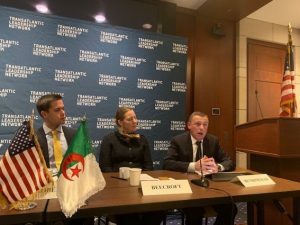 "Thanks to the dedicated effort by the reputable authors from Algeria, this volume will serve as yet another testament to growing of transatlantic cooperation between Algeria and the United States," says Sasha Toperich, Senior Executive Vice President of TLN. 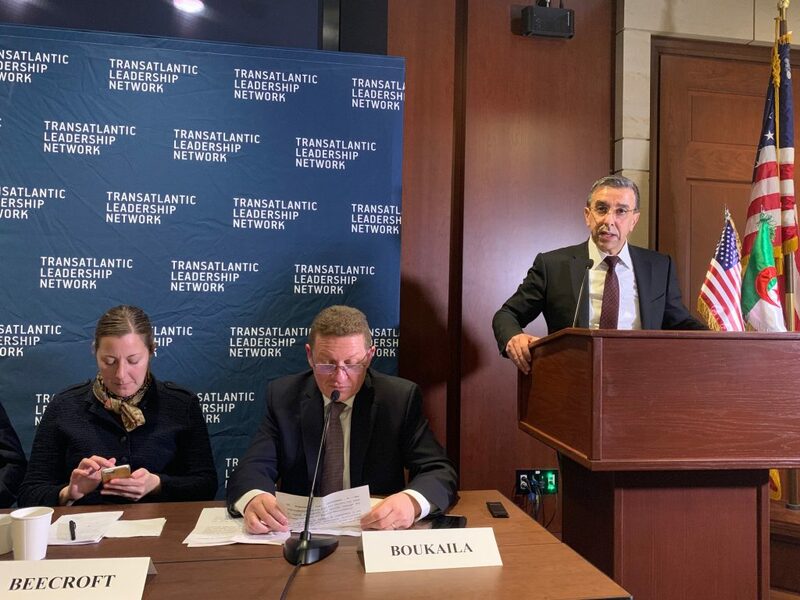 Senior Executive Vice President of the Transatlantic Leadership Network (TLN) Sasha Toperich welcomed attendees to the book launch of Algeria and Transatlantic Relations on January 14 at the U.S. Capitol. 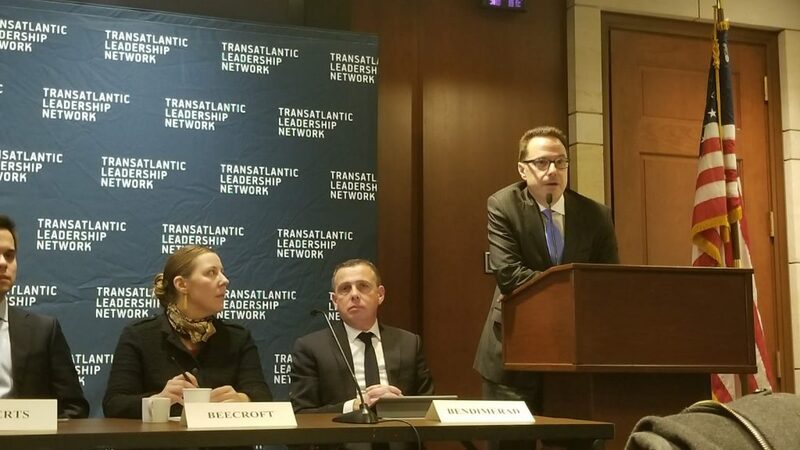 Jonathan Roberts, Project Manager of the Mediterranean Basin, Middle East and Gulf Initiative at the Transatlantic Leadership Network, moderated the panel. Panelists included Pamela Beecroft, Senior Program Officer at the Center for International Private Enterprise, Mehdi Bendimerad, Vice President of the Forum des Chefs d’Entreprises, Samy Boukaila, President and CEO of BKL Industries, Ismael Chikhoune, President of the U.S.-Algeria Business Council. 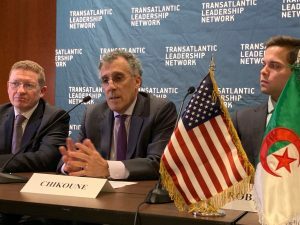 “Algeria is open for business,” stated Ismael Chikhoune, President of the U.S.-Algeria Business Council. Pamela Beecroft argued that an economy cannot be built for private sector growth without involving the private sector; that business support organizations are vital in that context; and that CIPE has seen a clear positive trend in Algeria’s overall environment for dialogue between government and businesses on economic reform. 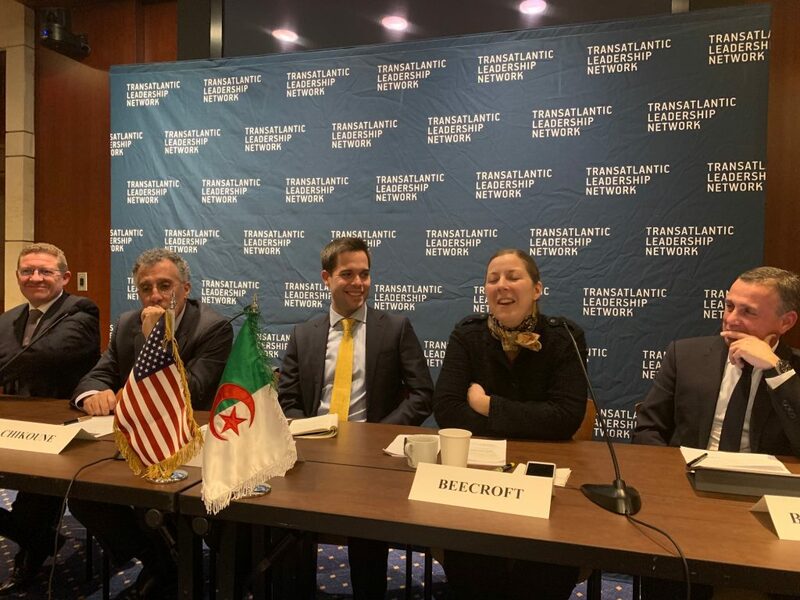 Mehdi Bendimerad reassured the American business community that Algeria’s business climate is making major progress and is in a continuous process of improvement. “The Algerian economy unquestionably presents itself as one of the most dynamic and profitable markets in the region. 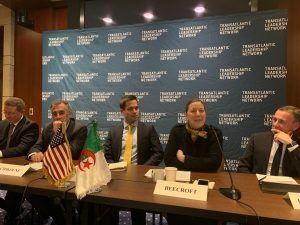 It is no longer acceptable that trade between Algeria and the U.S. remains at its current level is so little diversified. As I have said during my various trips to the U.S., Algeria wants to establish exceptional economic relations and a future with the United States. Important opportunities exist in various sectors besides hydrocarbons, such as mines, renewable energy, medicines, agriculture, and agribusiness. American expertise in the fields of biotechnology, digital economy, and the automotive industry are of interest to us. 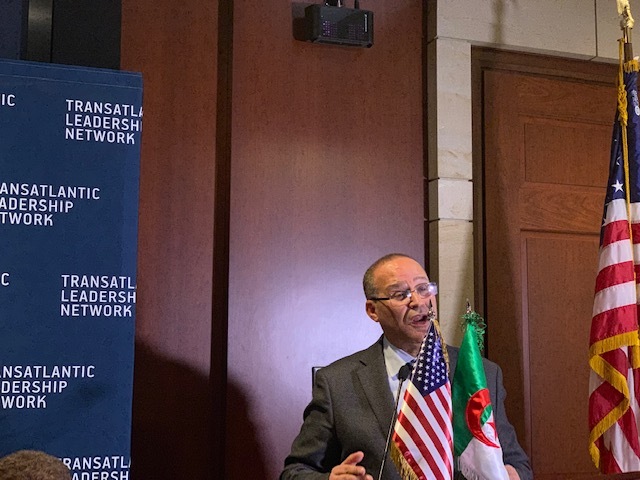 Abdelkader Bouazghi, Algeria’s Minister of Agriculture, addressed the audience after the panel, stressing the importance of strong relations between the United States and Algeria. 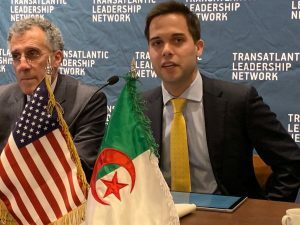 Haddad concluded by celebrating the Algerian-American partnership: It is in this spirit of friendship and partnership that our relations continue to grow and consolidate in the political, economic, cultural and anti-terrorist fields. In recent years, there has been a new dynamic of partnership between companies in both countries. Business communities are getting closer and exchanging. More and more Algerians are going to the United States and English language learning is developing significantly. 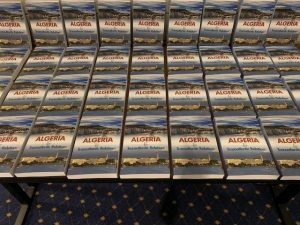 Algeria is undergoing a linguistic transformation. The economic policy pursued by President Abdelaziz Bouteflika has made it possible to create favorable conditions for the development and expansion of this cooperation.